Recommender systems are integrated with a significant number of Web applications helping users to find what may be of their interest. However, these systems do not always satisfy the users’ expectations regarding when and where recommendations are available, what is recommended, the source of the recommendations or how they are presented. Moreover, users may expect recommendations on sites that do not offer them. 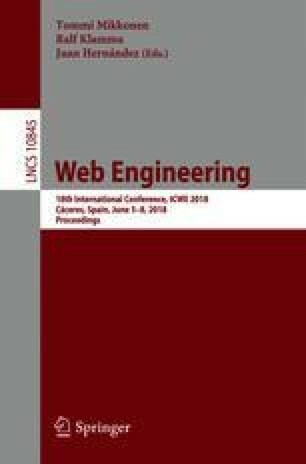 This work presents an approach for empowering users to generate a recommendation layer above the presentation layer of any existing (even third-party) Web application. The approach considers recommender systems as user-constructed artifacts, pluggable to any website and offering users full control at both stages of the recommendation process: the creation and the provision of recommendations. This paper presents preliminary work on the approach, concretely, a toolset to support our claims. Generalization tests on popular websites show no apparent restrictions regarding domain applicability.